Elder Jeran Jarman left on his mission only a few days after his family moved into our ward. If you remember, prior to his departure, he bore his testimony in Sacrament Meeting. He is currently in the MTC learning Korean and has been called to serve in the New York City South mission. We’re doing practice lessons with native Korean speakers. in my last one, I tried to explain the Godhead, who God is, and the purpose of the Holy Ghost and Jesus Christ. During which, I told her something along the lines of “God is your loving Daddy”. 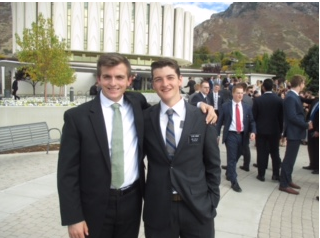 Another pair of missionaries followed up our lesson with their own. One of these elders, Elder Gilmore, ended his my bearing his testimony with conviction. Unfortunately, he enthusiastically told this investigator ‘I AM GOD.’ So yeah. Grammar matters.